Just like most of the teams, Sunrisers Hyderabad retained their core of players for the Indian Premier League 2019 (IPL 2019). At the auction, Sunrisers Hyderabad bought only three players- Jonny Bairstow, Wriddhiman Saha, and Martin Guptill. However, the Hyderabad-based franchise traded three players for left-handed opening batsman Shikhar Dhawan. Sunrisers have one of the balanced teams in the IPL and is loaded with experienced players. SRH Squad in IPL 2019: Team Profile, Schedule of Sunrisers Hyderabad in VIVO Indian Premier League 12. However, there are few youngsters in the team who will be looking to impress one and all in the upcoming season. With experienced players like Kane Williamson, David Warner, Bhuvneshwar Kumar, Rashid Khan and Yusuf Pathan in SRH’s ranks, the youngsters will get to learn a lot. 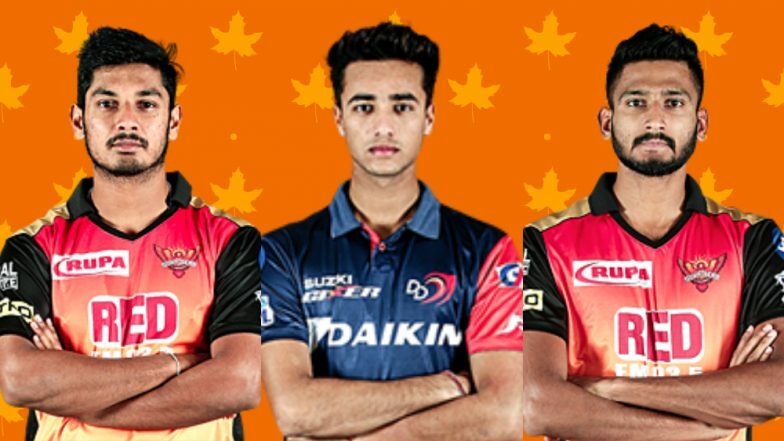 Ahead of the IPL 2019, we take a look at some upcoming talent in the SRH squad. Khaleel Ahmed: The left-arm fast medium bowlers made his IPL debut last year. Though he featured in just one match for the Sunrisers and in three overs he gave away 38 runs without picking a wicket. Ever since that, Khaleel has played for India in eight ODIs and nine T20Is. Now having played cricket at the highest level, Khaleel is expected to be a regular member of the SRH team. Abhishek Sharma: The 18-year-old was one of the players SRH traded for Dhawan from Delhi Capitals. Abhishek also made his IPL debut last season and smashed an unbeaten 46 off 19 balls. Abhishek is a handy lower-order batsman and can hit the ball hard. Ricky Bhui: The 22-year-old is a top-order batsman. Ricky made his debut last season and just like some of the youngsters he featured in just one game. In his debut game, he was not required to do much and faced only five balls. In 34 T20s the Andhra batsman has scored 834 runs which includes a century and six-half centuries. Sunrisers Hyderabad lifted their only IPL trophy in 2016. Last season, under Kane Williamson’s captaincy, Sunrisers made it to the final but lost to Chennai Super Kings. In last three seasons, they have consistently qualified for the playoffs.